VATICAN CITY (CNS) — The sounds of a woman chanting in a side chapel blended with the less traditional hum of a hydraulic lift one recent morning in St. Peter’s Basilica. 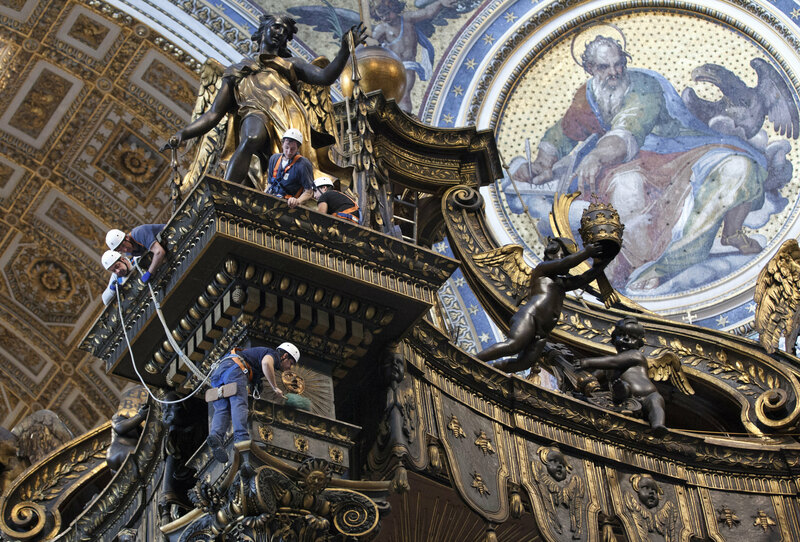 Pilgrims were pressed against a barricade pointing cameras at workmen strapped in climbing harnesses, teetering atop the baldacchino, the massive bronze canopy over the main altar. 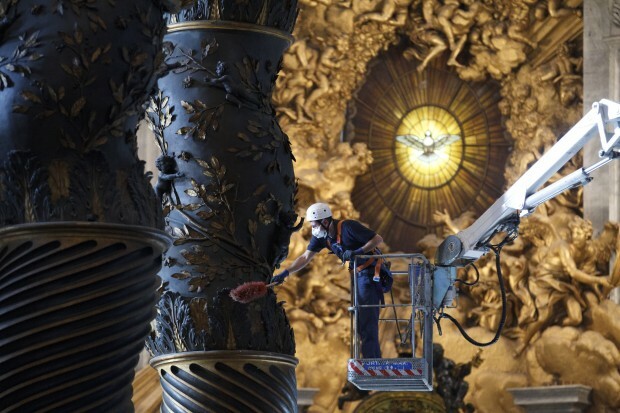 Twice a year, typically before Christmas and Easter, a select team of Vatican workers breaks out its polyester dusters, vacuum cleaner and bronze polishing fluid to clean Gian Lorenzo Bernini’s 100-foot-high, 63-ton masterpiece. Until recently, they had to climb up the twisting columns, hoisting themselves with wooden pegs and ropes, using the decorative bronze leaves and branches wrapped around the columns as toe perches and handholds. But recently they started borrowing an electric “spider lift” from the office governing Vatican City State, said Maria Cristina Carlo-Stella, chief of staff of the Fabbrica di San Pietro, the Vatican office in charge of the basilica. 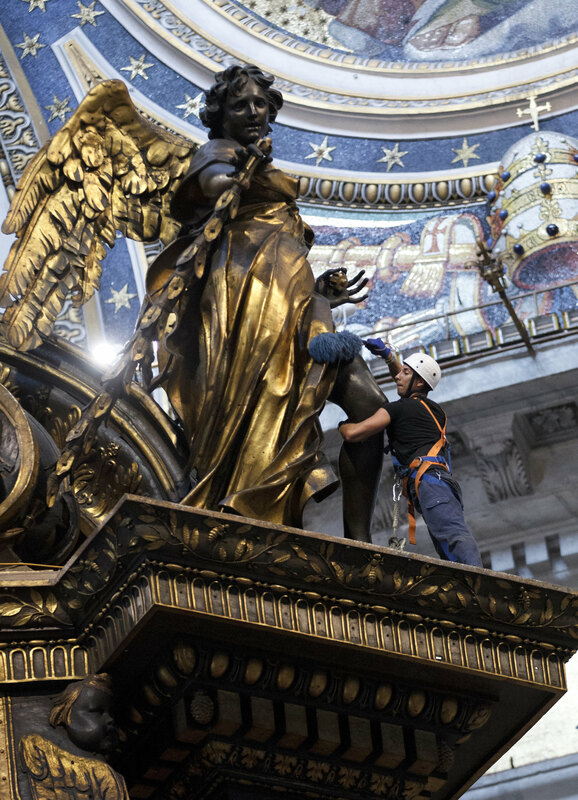 Now workers ride the boom lift to the top of the canopy, where they don white hard hats, snap on rubber gloves and pull down dust masks before they knot their safety lines around the neck of a 13-foot angel or the chubby legs of the 8-foot-tall “putti” that adorn the top of the canopy. Tradition isn’t completely dead, though. During the latest cleaning Dec. 18, Emanuele Roncaccia pulled out a thick length of rope from which dangled a short narrow plank worn smooth from decades of use. It turns out the bucket lift can’t reach all the dusty niches and nooks under the baldacchino, and the centuries-old method of rappelling and circling round the capitals and columns with a duster in hand works better than the more cumbersome lift. With a safety line clipped to Roncaccia’s back, workers helped connect the thick rope to his body harness. He slid the wooden plank under his backside, then launched himself carefully off the ridge of the top of the canopy. Four workers up top held both the rope and the safety line as he quietly called out his next move. “Don’t let me down too much,” he cautioned. “At first you’re really scared because it’s not something you do every day,” he told Catholic News Service. “But then you remember you’re physically fastened to the church and what could go wrong? Then you start only thinking about what you have to do” and it gets easier. Just a dozen men out of the 78-man corps of basilica workmen — known as “sanpietrini” (which might be translated as “St. 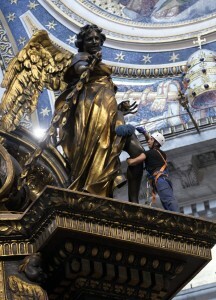 Peter’s Boys”) — are tasked with the wall-crawling work of cleaning inside and outside the basilica at dizzying heights. Workers in the past added their own special touch by etching their names and the year they climbed the monument into the giant gilded globe that tops the canopy. The spiraling columns are especially replete with intricate details that the untutored eye could easily miss, Carlo-Stella said, such as a bronze rosary hanging off the base of one column as if someone absent-mindedly left it behind. “Bernini gives a playfulness to the piece” especially evident in the large “putti” or cherubs playing with the papal keys and tiara on the canopy’s top, she said. Yet she noted that the canopy’s magnificence is meant to mark the most venerated place in the church — the tomb of St. Peter below — and to highlight the altar where the pope, the successor of Peter, celebrates Mass. Roncaccia and Benedetti both said that the best part of their job is the personal satisfaction they get after having done an important service to the church for Christmas Eve, when television cameras are focused on the pope under the baldacchino.